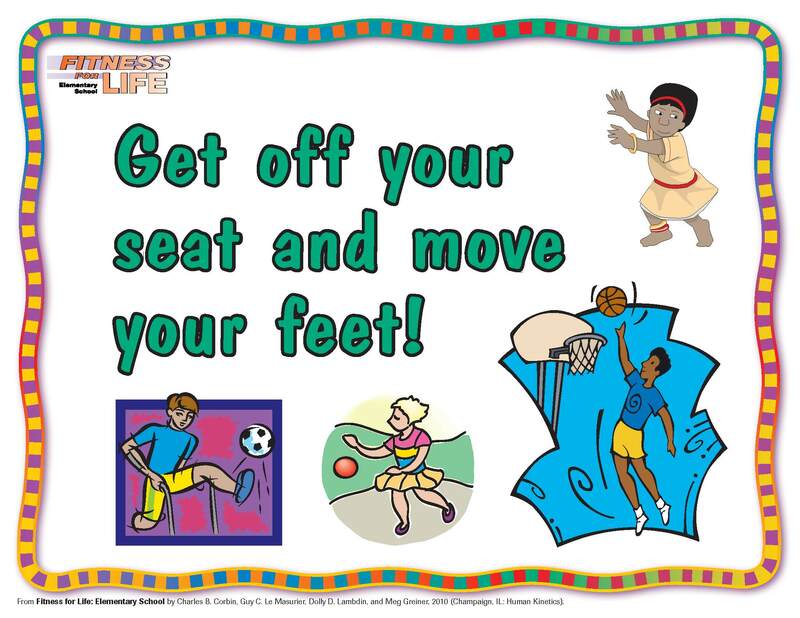 The Fitness for Life: Elementary School Wellness Sign Pack offers a portion of the signs included in the full Fitness for Life: Elementary School package. This pack will help you with the printing costs each year and allow you to deliver the themes and messages of each Wellness Week. What is Fitness for Life: Elementary School? The award-winning Fitness for Life middle and high school programs now have an elementary school companion program. Fitness for Life: Elementary School is an innovative multimedia program that facilitates total-school involvement by using physical education lessons, classroom activities and discussions, recess, before- and afterschool activities, and family nights to deliver appropriate physical activity, plus concepts to promote health-related fitness and active lifestyles. Fitness for Life: Elementary School was developed by nationally and internationally recognized leaders Charles B. “Chuck” Corbin, Guy C. Le Masurier, Dolly D. Lambdin, and Meg Greiner. The program has been field tested and is based on the most current research and standards regarding health-related fitness, activity, wellness, and nutrition. Charles B. “Chuck” Corbin, PhD, is currently professor emeritus in the department of exercise and wellness at Arizona State University. He has published more than 200 journal articles and is the senior author, sole author, contributor to, or editor of more than 80 books, including the 5th edition of Fitness for Life (winner of the TAA’s Texty Award), the 14th edition of Concepts of Physical Fitness (winner of the TAA’s McGuffey Award), and the 7th edition of Concepts of Fitnessand Wellness. His books are the most widely adopted high school and college texts in fitness and wellness. Dr. Corbin is internationally recognized as an expert in physical activity, health and wellness promotion, and youth physical fitness. He has presented keynote addresses at more than 40 state AHPERD conventions, made major addresses in more than 15 countries, and presented numerous named lectures (Cureton, ACSM; Hanna, Sargent, and Distinguished Scholar, NAKPEHE; Prince Phillip, British PEA; and Weiss and Alliance Scholar, AAHPERD). He is past president and a fellow of AAKPE, a fellow in the NASHPERDP, an ACSM fellow, and a lifetime member of AAHPERD. Among his awards are the Healthy American Fitness Leaders Award (President's Council on Physical Fitness and Sports—PCPFS, National Jaycees), AAHPERD Honor Award, Physical Fitness Council Honor Award, the COPEC Hanson Award, and the Distinguished Service Award of the PCPFS. Dr. Corbin was named the Alliance Scholar by AAHPERD and the Distinguished Scholar of NAKPEHE. He is a member of the advisory board of Fitnessgram and was the first chair of the science board of the PCPFS and the NASPE Hall of Fame. In 2009 Dr. Corbin was chosen for the Gulick Award, the highest award of AAHPERD. Guy Le Masurier, PhD, is a professor of physical education at Vancouver Island University, where he teaches courses in pedagogy, research methods, and nutrition for health and sport. Dr. Le Masurier is coauthor of the award-winning book Fitness for Life: Middle School (winner of the TAA’s Texty Award) and has edited and contributed to several books, including the 5th edition of Fitness for Life: High School and the Physical Best Activity Guide. He has published numerous articles related to youth physical activity and physical education and served as a coauthor on the NASPE Physical Activity Guidelines for Children. Dr. Le Masurier has delivered over 30 research and professional presentations at national and regional meetings and currently serves as the Epidemiology section editor for Research Quarterly for Exercise and Sport as well as the Health Foundations section editor for the International Journal of Physical Education. Dr. Le Masurier is the creator of the Walk Everyday Live Longer (WELL) program, a pedometer-based physical activity program used by the Arizona Department of Health Services. Dr. Le Masurier is a member of AAHPERD, NASPE, and ACSM. He lives with his wife on Protection Island in British Columbia, where they serve their community as volunteer firefighters. Guy is thankful for his morning kayak commutes. Dolly D. Lambdin, EdD, is a senior lecturer in the department of kinesiology and health education at the University of Texas at Austin, where she teaches undergraduate courses in children’s movement and methods of teaching as well as graduate courses in analysis of teaching and technology application in physical education. 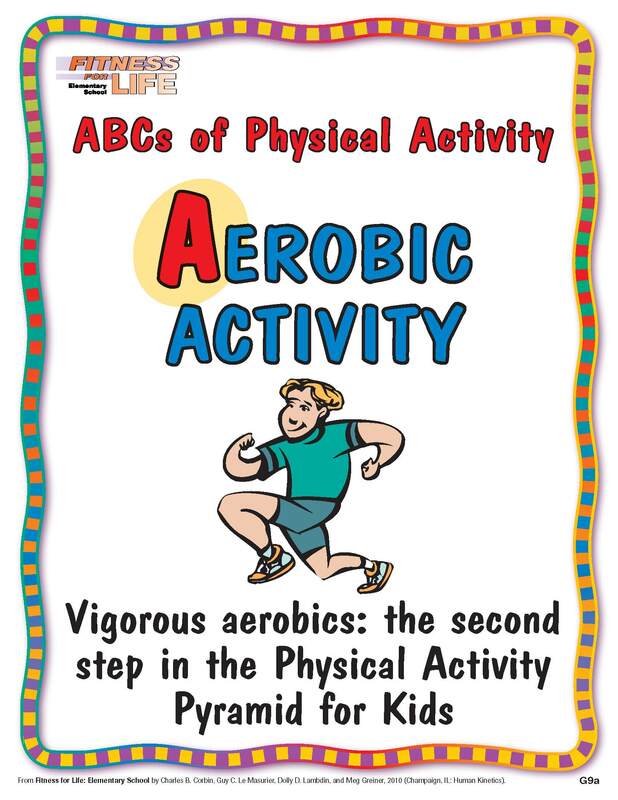 Aerobic Activity sign - ABCs of Physical Activity Get off your seat and move your feet! 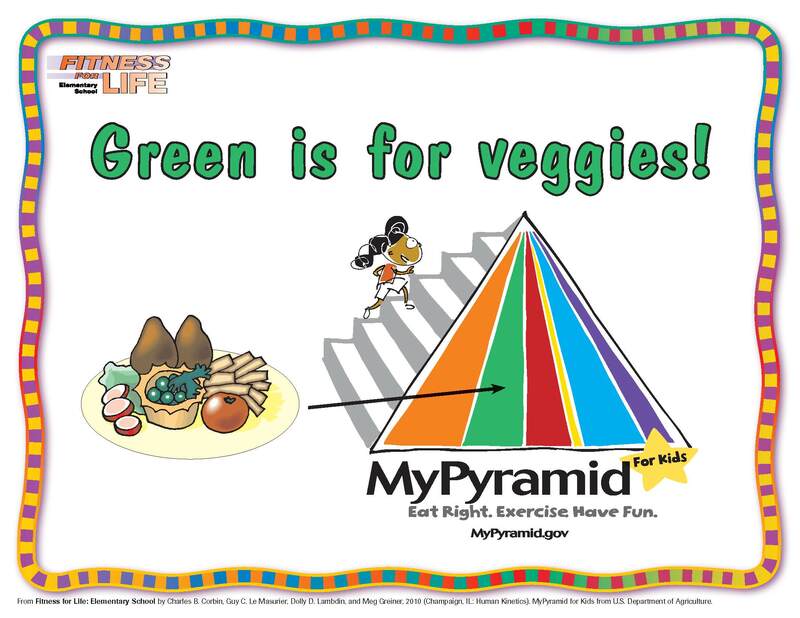 Green is for Veggies!